After 5 months of waiting on a preorder, my Solidoodle Press 3D Printer finally arrived, on my birthday of all days! Note: I published another blog post which includes more technical detail about my initial issues with the printer. The Solidoodle Press is a brand new model of printer from one of the many companies now making 3D printers for hobbyists. 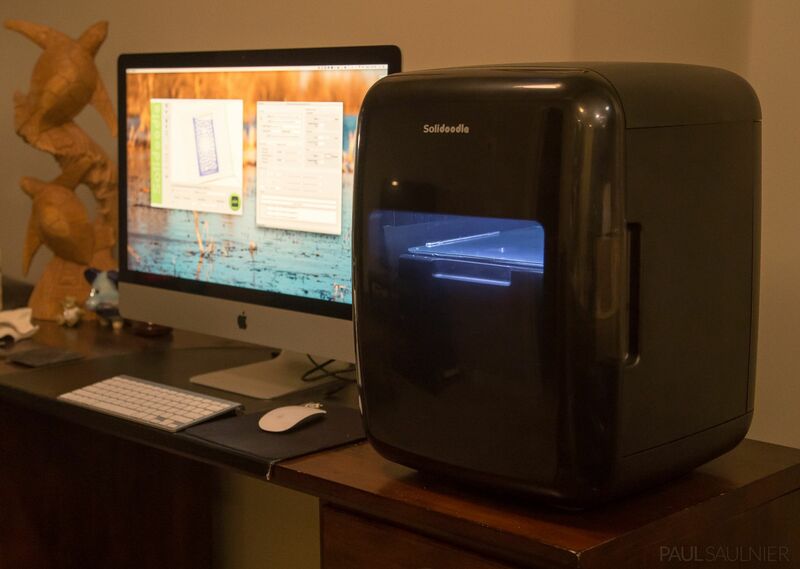 Many printer models have a very open and robotic design, but I was drawn to the Solidoodle Press due to its low introductory price of $400 (now $600) and its fully enclosed design which protects it from dust and doesn’t look too ugly when not in use. If you’re not familiar with how 3D printers work, in essence, there’s a couple types of models. Printers like mine create objects by printing them layer by layer ranging in height from 0.3mm down to as low as 0.1mm (which takes 3 times as long, of course). 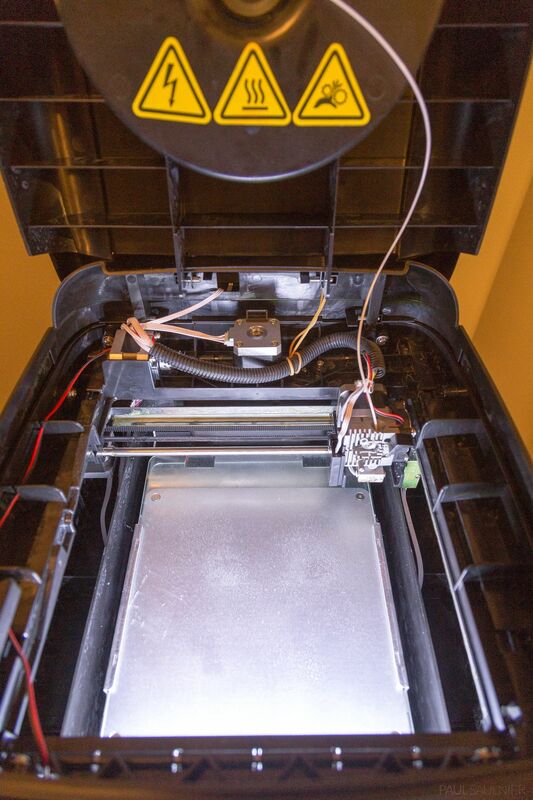 Plastic filament is fed through the printer from a spool (5 lb size is standard) and slowly melted by the printer as it builds the object on the printer bed. A simple print can take hours as a result. The colour of the filament controls the colour of the output. Some printers can use two spools simultaneously to have a 2-colour design, or you can paint the object after it has been printed. Some 3D printers use liquid plastic or metal instead of solid plastic to create objects, but I don’t have experience with those. The Solidoodle Press model was advertised as “plug and play” and easy to use out of the box, but my struggles with it so far prove this is not the case unfortunately. My unit had several small issues and missing screws out of the box from the factory. Still, since competing printers can easily retail for over $1000 or even much more, I wasn’t willing to give up due to issues I could fix myself. I had to install missing screws to stabilize the print bed. Plastic was jamming inside the extruder head, so I had to increase the temperatures beyond the defaults to ensure a consistent flow of plastic. The extruder head also clogged up, requiring me to clean it out using a drill before it would work again. After a couple days of debugging and failed prints, I managed to get several successful prints, and figure out the process. 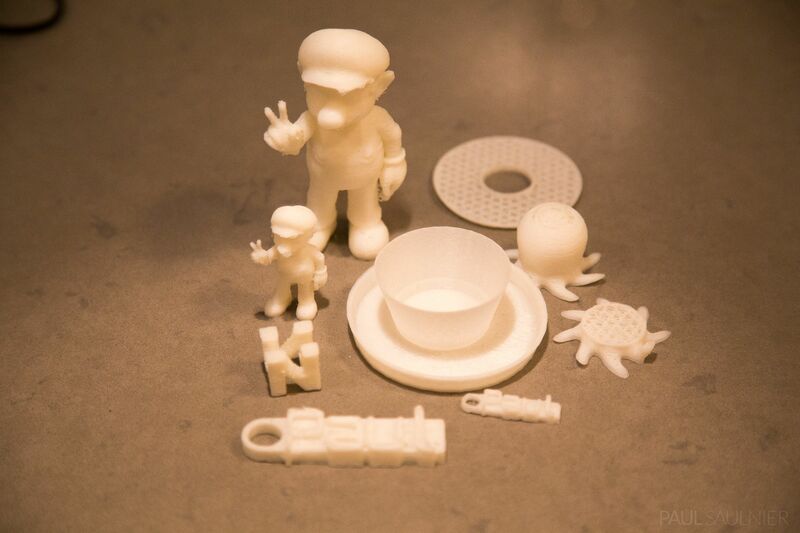 Among my successful prints is Super Mario at two sizes, a personal keychain at two sizes (the smaller one was my very first print), and an octopus, first a partial one, followed by the full successful print. I didn’t actually designed these 3D models myself. I downloaded them for free from the popular Thingiverse web site. 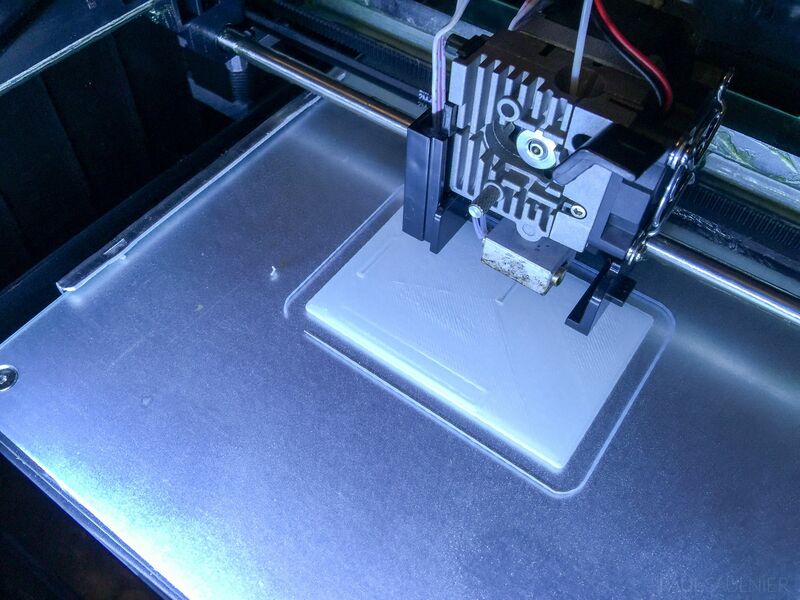 I print with the lid open to prevent too much build up, and to easily see what is happening. It’s pretty cool to watch an object come to life, one small layer at a time. In the top right area of the printer, you can see where I had to install a rubber band to help keep the cords out the way of the extruder head. 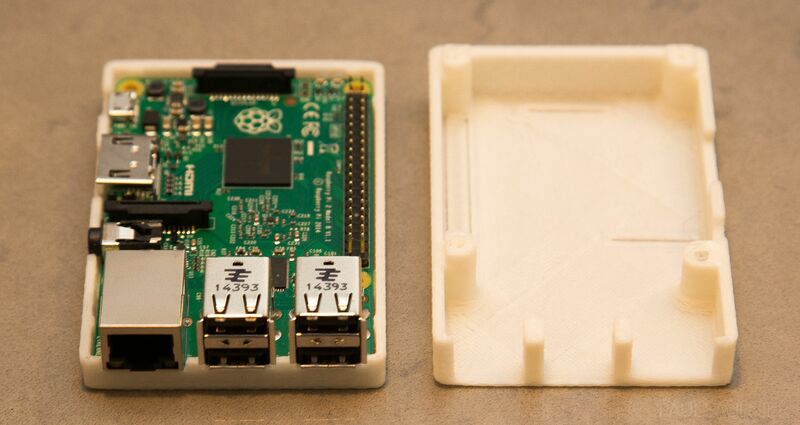 One of the things I wanted to print was a case for my Raspberry Pi, which is an inexpensive tiny computer a single circuit board. It’s hard to use for anything with all the metal contacts exposed. Layer by layer, the printer creates the case. A narrow border is drawn around the print area at the beginning. This seems to help clean the extruder head of any debris or melted plastic that might interfere with the print. It also reassures the printer operator that everything is working if they happen to be using a model like mine where success is not guaranteed. Here is the finished product with the Pi’s board installed into the base, and cover next to it. I was initially experiencing major issues with lifting. The cover on the left became very deformed on one corner, and didn’t fit properly. The solution to this problem was “extra hold” hairspray, available at any pharmacy. After applying the hairspray, the case printed more consistently, as shown on the right. Below you can see my case being printed. Unfortunately, my printer still has one technical issue which I cannot solve myself, and am waiting on Solidoodle’s backed up support team to resolve. The printer bed heats up as soon as I plug the printer in, even if the printer is “off”. This is a potential safety issue, and I’ve heard it requires the printer to be returned. To close out this post, I’ve uploaded a quick video below to show the print process in action.